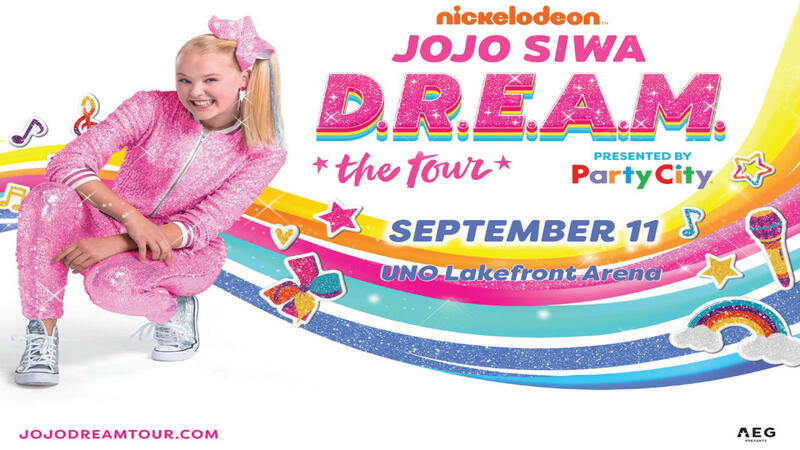 Get ready New Orleans as NICKELODEON'S JOJO SIWA D.R.E.A.M. THE TOUR PRESENTED BY PARTY CITY arrives on Wednesday, September 11th! Tickets go on sale Friday, April 12 at NOON. Tickets available at the UNO Lakefront Arena Box Office, online at www.ticketmaster.com or charge by phone at 800-745-3000. Ticketmaster is the official ticketing provider of the UNO Lakefront Arena. There is a $10 parking charge per car for all special events; cash only on site. The UNO Lakefront Arena is a non-smoking facility. Doors to the venue are scheduled to open 1-hour prior to show time. The following are restricted items and actions - smoking, professional style cameras (removable lens, 35mm and including iPads or Tablets, etc. ), audio recording devices, video recording devices, illegal drugs, flash photography, weapons of any kind, guns, knives, tasers, mace, flash lights, glass items, cans, containers of any kind, fireworks, aerosol cans (including hairspray), political banners, radio scanning / jamming equipment, outside food, beverages, or alcohol, banner poles, laser pointers, spiked jewelry, chains (including those on wallets), backpacks, large bags or purses (nothing larger than 14" x 14"), glow sticks, objects that may be used as projectiles, moshing or crowd surfing & other items and activities deemed unsafe and a challenge to public safety. Restricted items should be returned to your vehicle for storage. The nature of a live concert performance will vary by musical genre and individual groups in those genres. Live performances may contain adult content, including potentially offensive adult language. The University of New Orleans and UNO Lakefront Arena expressly disclaim responsibility for the content of this live performance.